A almost seedless variety, Mandarin Satsuma Okitsu Wase is also low in acidity with excellent taste. A small tree to around 3m in height with a similar spread the tree itself has a slight weeping habit and is attractive in the garden. The Wase part of the name is from the Japanese for ‘early’, referring to the early season fruiting nature. In Australia Mandarin Satsuma Okitsu Wase will fruit in Autumn (April – May). Newly planted trees will often have a few rather large fruit. After a year or two they settle to higher yield and normal size fruit. Like all Satsuma types it is easy to peel, very few seeds and the fruit lasts well after harvest. 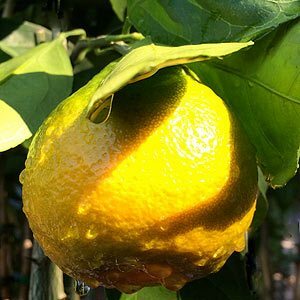 Mandarin Satsuma Okitsu Wase is a fairly fast growing tree and produces good sweet flavored fruit from early to mid season. A self pollinating variety, high yielding with slightly oval shaped fruit, good orange skin and nice flesh color. This is one of the best selections for the home garden.